I love seeing something I haven’t seen before. For a life-long Mainlander, Hawaii is rife with these opportunities: boiling calderas, rivers of lava, volcanic beaches, dense jungles teaming with color and exotic wildlife, and a seemingly infinite variety of waterfalls. 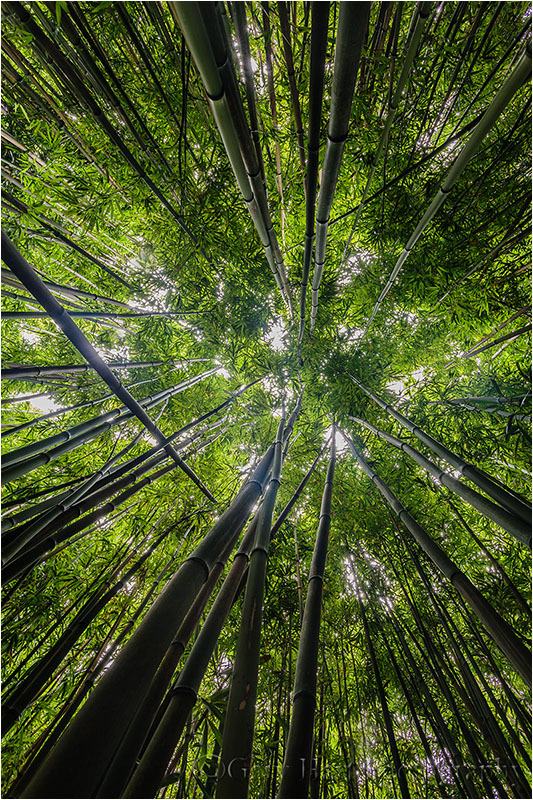 But none of this quite prepared me for Maui’s bamboo forest. I knew of the bamboo forest, both through word-of-mouth and from travel guides, but everyone said the hike up, while relatively short (true) is pretty grueling (not so much). Since a workshop group can only travel as fast as its slowest member, and workshop scouting is usually my priority on Maui, I’d heeded warnings and avoided the forest on previous trips. But on this visit I vowed to hike up to the forest to see for myself. I’m so glad I did. The trail starts at Haleakala National Park Kīpahulu Visitor Center, also home to the ‘Ohe’o Gulch (popularly know as the Seven Sacred Pools). After a mile of steady, moderate climbing I came to a pair of bridges across a set of waterfalls at the junction of two creeks—quite photogenic when not swarmed with adventuresome divers plunging into the inviting pools below. The view from the downhill side of the bridge looks straight up a mountain covered with bamboo as far as the eye can see (a great spot to catch your breath). Immediately across the second bridge the trail climbed briefly, and with a final twist deposited me into a different world—for the next hour or so I wandered a narrow tunnel in amazement, gazing up at vertical stalks so densely packed that in many places it was difficult to stray from the trail, and occasionally trying to capture the scene with my camera. With the horizon in all directions replaced by receding stalks of bamboo that seem to extend without end, I found the forest quite disorienting. Much of the sunlight striking the bamboo at the top didn’t make it to the forest floor, giving the entire scene the incongruous feel of dusk, though it was midday. The sparse light that did filter through did so in splashes that danced on the forest floor with the swaying bamboo. Occasionally the breeze stiffened enough knock the tops of the bamboo together, sending hollow echoes like amplified wind chimes overhead. Soon the grade eased and a long boardwalk transported me above the ubiquitous mud that forms on this relatively level stretch. After about 2/3 of a mile I exited the bamboo tunnel and soon found myself face-to-face with Waimoku Fall, a 300+ foot cataract that (believe it or not) seemed anticlimactic after what I’d just walked through. Back at the car I came to two conclusions: I have to get my group up there, and I hadn’t yet figured out how to photograph it. While I was pretty sure not everyone in the workshop would complete, or even attempt, the hike, I was pretty confident those who did would find it worth the effort. Fortunately, the trailhead’s location at ‘Ohe’o Gulch made it easy for me to give everyone options: We’d photograph sunrise as a group at the pools, then everyone would be on their own to try the trail (it’s a nice hike, complete with a waterfall and regal banyan tree, even if you don’t make it to the bamboo), explore the pools further, or browse the Visitor Center, until we met again at 10:00. And that’s just what we did. About half the group made it as far as the forest, and few even went as far as Waimoku Fall (they agreed that their time would have been better spent photographing the bamboo). After making it to the forest I dropped my backpack and walked back down the trail to encourage and/or assist those following. By the time I made it back up to where I’d stashed my gear I didn’t have tons of time for photography, though I was able to spend a little time exploring a hidden creek that I’d like to return to. 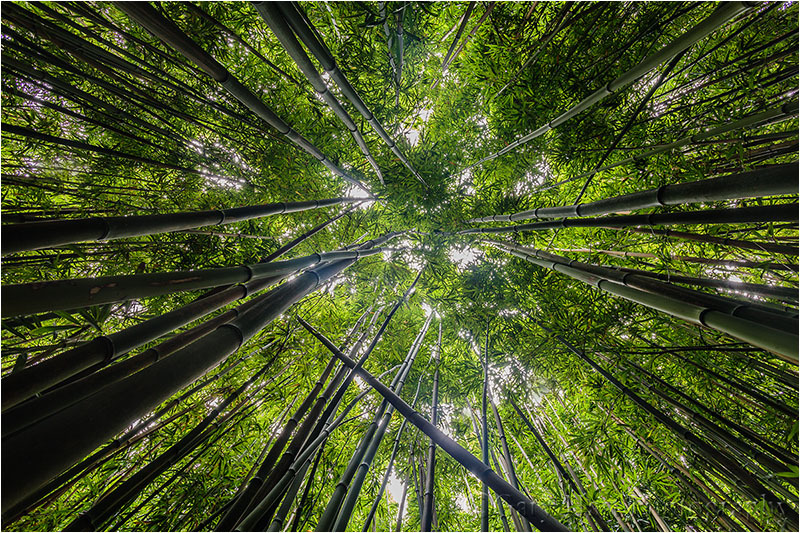 Briefly venturing off the trail and into the forest (no small feat with a loaded backpack and tripod), I was able to attempt some straight up compositions I hoped would capture the sense of parallax distortion the towering bamboo gave me. With my widest lens I lowered the camera near to the ground and pointed it upward. This gave me parallax effect I sought, but I wasn’t completely satisfied until I included a tilting bamboo stalk cutting diagonally into the frame. A look at the exposure settings should give you an idea of how dark it is among the bamboo (the sky in my image is hopelessly blown). The utter calmness of this second visit (no knocking bamboo this time) allowed me to avoid f-stop and ISO compromises, instead going with a four second exposure without motion blur. One more great thing about composing straight up is that there’s no real horizontal/vertical component to the frame—this allows me to rotate the final image either way to suit whatever orientation I need. Hi Marilyn, it’s good to see you’re paying attention. 🙂 Have a great time at Anza Borrego. It would be great to see you (and the rest of your entourage) in a workshop next year.